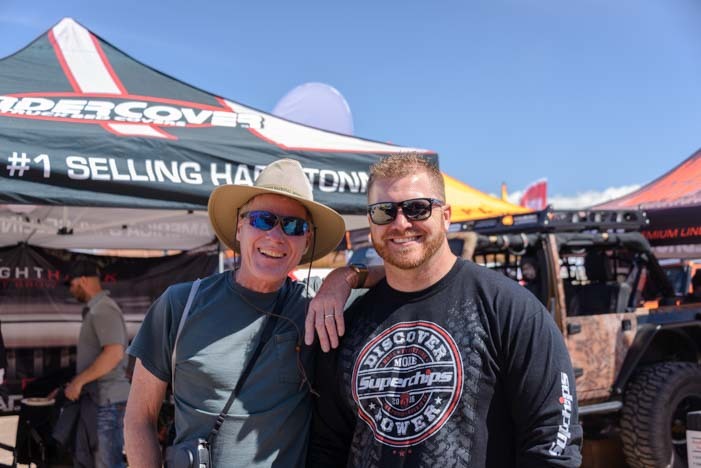 This entry was posted in RV & Boat Projects & Upgrades and tagged New, News, Non-Travel, RV Tech Tips, RV Tech Tips Truck by Roads Less Traveled. Bookmark the permalink. Mark, I’m a recent follower of your posts, blogs and other content on your site. So I wanted to start by saying Thanks for all the great content. I’ve been researching this as a lifestyle change when I retire in 18 months or so and have found info here very valuable. Keep up the flow of good info. My question is in regards to the Edge tuner. I see that when you went from your Dodge RAM 3500 SRW to DRW you also upgraded engine tuners from the Evolution (plug-n-go) to Juice with Attitude (custom install). From your prior Edge tuner post I understand that even a novice could install the Evolution. But regarding the Juice with Attitude, you also indicated that some additional work was involved to integrate with the onboard computers. How much extra work and knowledge is required to install the Juice with Attitude tuner? 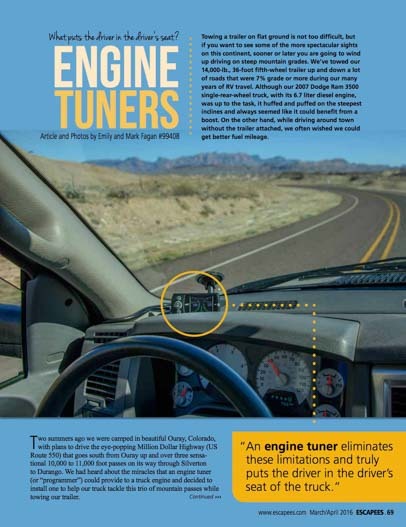 Also, was the October 2014 version of Diesel Power Magazine the sole reason you selected Edge as your preferred tuner? I don’t yet have a truck, nor the make and model identified for my needs. That is still an in process decision. Thanks again. Chris, thank you for the compliments about the content on this blog and my writing. Mark is an incredible electromechanical engineer and technician, and I always marvel at his expertise and the speed with which he works. It was his profession for 26 years. I (Emily) am the writer in the family, however, and all the writing is done by me, both on this blog and in the various magazines I write for. I was a software engineer for two decades and I was a physics major in college (as well as an English major), and I love technical things. So we have a lot of fun on these projects together. I always refer to our work as “ours” because we each bring unique skills into the mix, but the words are mine and the one holding the wrench is Mark. The Evolution tuner is plug-and-play and was very easy. The Engine Gas Temp sensor that tied into it was a bear of an installation, however, since the probe gets installed in the exhaust manifold. We have a step-by-step pictorial guide for how to do this installation at this link. The Juice with Attitude has several wiring harnesses that have to be installed. The hardest part on our truck was unclipping one of the factory installed wiring connectors in the engine compartment (hard to reach) and screwing the very long bolt into the plastic molded housing that Edge provides for mounting the display on the dashboard (the bolt and the hole were at an odd angle). Other than that, it is not difficult. Each connector is unique and is keyed, so you can’t screw up. But you need to take your time and read the instructions. I am going to write up a detailed blog post about our new tuner. We just installed it a few days ago and love it so far, but we need more time with it to see how it does in various conditions. We also put the truck on a dynamometer, so we have some video footage and graphs to share about how the tuner increased the horsepower and torque between Stock and Towing (Levels 0 and 2). If you didn’t see our post about our recent truck buying process, it is at this link. Mark says that issue of Diesel Power Magazine was what got him thinking about getting a tuner. After doing some research into the various brands on the market, he felt the Edge was the safest. He says many of the others seemed, to him, to be targeted more towards hot-rodding and racing. His concern was reliability and he felt the Edge track record was better than the other brands.